A concrete chair with a form modeled in Rhino3D based on a hybrid of four chair shells we had been using around our studio. A mold was cut by laser from many layers of plywood and sanded completely smooth. The form was covered in duct tape as a mold release, which also provided a beautiful surface texture and finish. 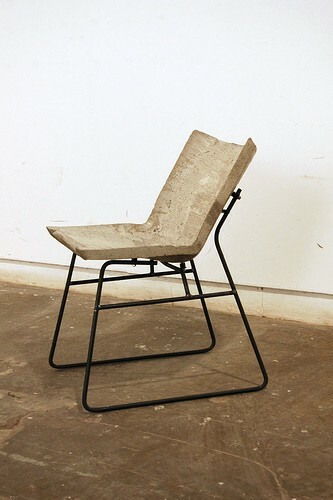 The form incorporated threaded female studs that were cast into the concrete chair shells. Neoprene rubber vibration absorption mounts were threaded into the studs to provide shock protection between the concrete shell and the steel rod base. The base is a bent rod sled-type with six connection points to the shell. We cast a total of three shells and produced one base, focusing our efforts on achieving the optimal mix design and pouring method. We also tested the shells for use in public outdoor locations, and as stackable masonry units.